We have seven and half new polls to report today. The most important one is in Colorado, where Kerry and Bush are now tied at 47% each according to the latest Survey USA poll. Yesterday's lead story was about the Colorado referendum, how the Democrats want to split the state's votes in the electoral college so Bush won't get all of them. It will be interesting to see what happens now that they are tied. Suppose Kerry takes the lead there. Will the Democrats suddenly oppose te referendum to avoid giving Bush any electoral votes? Will the Republicans suddenly support it? It could get pretty complicated if the lead switches back and forth. Stay tuned for all the excitement (if constitutional amendments in Colorado turn you on, at least). For any lawyers or lawyer wannabees who want to look into the constitutionality of the referendum, here are the full texts of the U.S. constitution and the Colorado constitution. A poll in Nevada, shows Bush hanging onto his 1% lead there. The state is now at Kerry 46%, Bush 47%. Interestingly enough, Badnarik is at 3%. Nader is not rated. The poll was done on a single day, Aug. 16. We have seen this pattern before--in New Mexico. My guess is that Badnarik commissioned the poll. If this pattern continues to hold, that is, when the pollsters ask about Badnarik explicitly he gets a few percent and when they don't he is in the noise could have ramifications. He may be doing better than anyone realizes. This also says something about the population. If the pollster names a name, the person gets a couple of percent of the vote. If I had $15,000 to burn, I might commission a poll in New York asking whether people are planning to vote for John Kerry, George Bush, or Yogi Berra, just to see what came out. A new poll in California conducted by the Public Policy Institute puts Kerry ahead there 54% to 38%. Since the poll ended the same day as our previous California poll, an average is used, but the difference is small. A poll in Wisconsin has the candidates tied at 46% each. Another poll in the Midwest, Michigan, shows that Bush has reduced Kerry's lead there somewhat. It is now Bush 42%, Kerry 46%, Nader 2%. A new poll in Maryland gives Kerry a 13% lead there, 53% to 40%. Maryland looks safe for him. 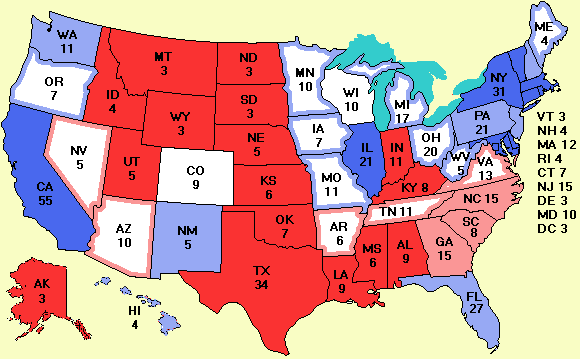 Similarly, a new poll in Oklahoma affirms that state is a sure win for Bush. He has a 20% lead there now. Now the half poll. Strategic Vision announced it made a mistake normalizing an earlier poll in Georgia. It underweighted African Americans, who are overwhelmingly Democratic. The new result is Bush 51%, Kerry 46%.